New York City-based Peloton has raised another $550 million in financing to support its connected home exercise equipment and virtual workout class business. With this Series F round, Peloton’s total funding is just shy of $1 billion raised. The round was led by TCV, with support from returning investors Tiger Global, True Ventures, Wellington Management, Fidelity, NBCUniversal, Kleiner Perkins, and Balyasny. New investors such as Felix Capital, Winslow Capital, and other unnamed mutual fund partners participated as well. 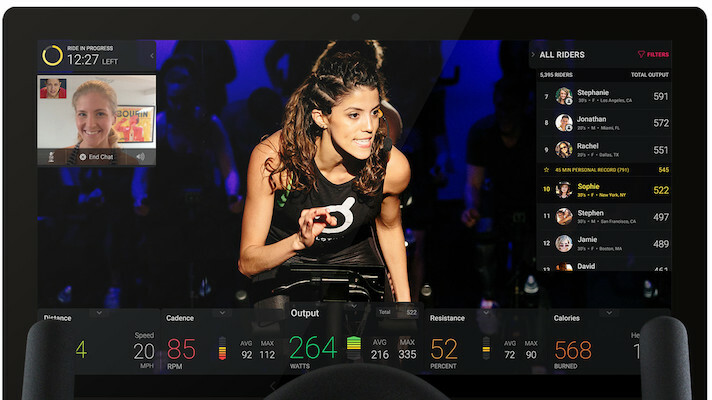 Peloton's primary consumer offering is an exercise bike integrated with a tablet-like screen. With this, users can join in live or pre-recorded classes with on-staff cycling instructors. During live sessions, real-time social features like leaderboards or video chats with friends keep users immersed in the process. Earlier this year the company also launched an app-based digital subscription service offering many of these live and pre-recorded fitness features, and will soon be releasing a connected home treadmill similar to its primary exercise bike offering. The new funding will allow the company to expand into additional international markets, according to a statement, and will also be used for “general corporate purposes” such as providing liquidity to existing shareholders. Currently, the company has plans to launch in the UK and Canada this fall, and is looking to open 20 or more retail showrooms for its products by early 2019. In addition, the company has announced plans to open a new campus for member support services in Plano, Texas, and a studio complex in New York City that will house Peloton’s broadcast and production operations. The recent funding announcement follows a $325 million round that helped the connected fitness company achieve “unicorn” status back in May 2017.